Ralstonia solanacearum is a pathogen of world-wide significance causing lethal wilt disease across an array of crops including potato, tomato, eggplant, tobacco, ginger and banana with different races, biovars or sequivars prevalent in different regions across the globe [1-5]. The pathogen survives in soil and crop debris for long periods, but often loses the viability and virulence when maintained in culture by routine methods [1, 5-7]. 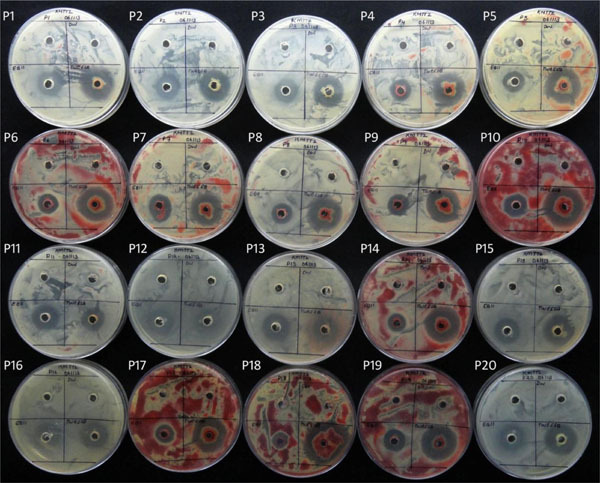 Development of avirulent mutants is very common during prolonged culturing on agar plates or while storing in water / liquid media due to oxygen or nutrient stress [1, 7-10]. The tetrazolium medium containing casein hydrolysate (C), peptone (P), glucose (G), agar (A) and 2,3,5-triphenyl tetrazolium choride (TTC) was formulated by Kelman  as a modification of the CPGA medium to enable the identification of virulent isolates discriminating from avirulent and less virulent mutants. The virulent normal or wild types yielded irregularly-round, fluidal white colonies with a pink center on this medium while the common mutants encountered in stock cultures formed round butyrous (dry) deep-red colonies with a narrow bluish border . The former which corresponded to the fresh isolates from diseased plants were highly pathogenic while the latter as well as the intermediate types were either non-pathogenic or weakly pathogenic as per the inoculation tests on tomato seedlings . This medium is widely employed world-wide for the isolation of pathogen from various sources, discrimination between virulent and avirulent types, characterization of isolates and in physiological studies on the pathogen [7, 9-15]. We employed Kelman - triphenyl tetrazolium chloride (KM-TTC) medium for isolating the pathogen and further culture-growing for use in various laboratory and glass-house studies . Among the different isolates obtained from the bacterial ooze of tomato and eggplant, ‘NH-01’ from tomato was selected for further studies with short-term culture maintenance as water stocks and long-term storage in glycerol . 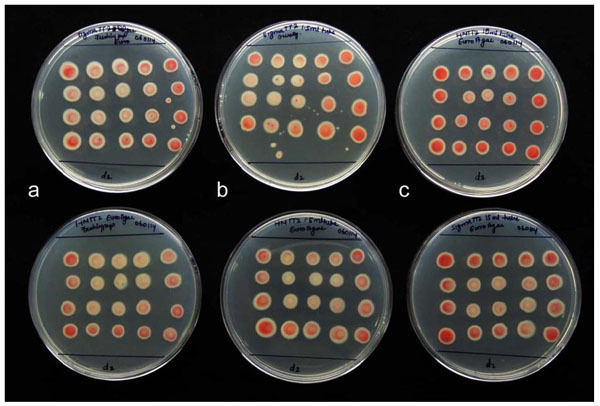 This isolate yielded white fluidy colonies with a light-red centre by 24-36 h on KM-TTC at 28-30°C and after 48-72 h gave rise to fluidy elevated crimson red colonies interspersed with white whorls in upper view, and red colonies of 6-8 mm diameter with a white outline of about 1 mm in rear view. Mortality to the extent of 80-100% was induced in the seedlings of susceptible cultivars Arka Vikas and Pusa Ruby within 2-4 weeks of challenge through root-injury-inoculation or petiole-excision-inoculation . This isolate occasionally showed variation in colony fluidity and colour on KM-TTC with inconsistency in virulence. Certain of the glasshouse evaluations for screening tomato breeding materials failed to show proper disease development. Therefore, the pathogen was re-isolated from a diseased seedling of cv. Arka Vikas after challenge inoculation. This re-isolate ‘NH-Av01’ showed the restoration of original colony characteristics on KM-TTC medium and pathogenicity . In order to minimize the chances of batch to batch variations of this culture, a set of 300 ampoules was prepared as glycerol stock and stored at -80°C. While reviving the culture for different trials, still variations with respect to colony characteristics, particularly the extent of fluidity and pattern of colour development were encountered. In addition to the inconsistencies in pathogenicity, differences in the patterns of lawn formation or inhibition zone development during antagonistic assays were observed in spite of the fact that the stock was prepared in one lot from the CPGA-derived 2-day old plate cultures. Diligent follow-up observations indicated that the inconsistency was linked to the KM-TTC media plates prepared in different batches. Aims of this study were to investigate the contributing factors in variations of colony characteristics of R. solanacearum on KM-TTC and to assess the role of such medium-induced variations on the virulence of the isolate or its response in biovar or antagonistic assays. Kelman-tetrazolium (KM-TTC) medium  contained 1.0 g l-1 casein hydrolysate (enzymic digest), 10 g l-1 bacteriological peptone, 5 g l-1 glucose, and 15 g l-1 bacteriological agar and was fortified with 0.005% 2,3,5-triphenyl tetrazolium chloride (TTC). All the media ingredients were sourced from Hi Media Biosciences, Mumbai (referred to as HM hereafter), and the constituents normally employed in KM-TTC included bacteriological peptone (Cat. no. RM 001-500G), casein enzyme hydrolysate Type II (CR 028-500G), dextrose - anhydrous (RM077-500G) and bacteriological agar (RM 006-500G). TTC was sourced from Sigma-Aldrich, St. Louis, MO, USA (referred to as Sigma hereafter), and the stock (10 mg ml-1) after filter-sterilization was stored as aliquots of 1.25 ml at -20°C, and incorporated to 250 ml of autoclaved (20 min at 1.1 Kg cm-2) and cooled medium just before pouring into plates. Single-use pre-sterilized 9 cm plates (HM, Mumbai) with 20 ml medium were used in all the studies. The media plates were used on the same day 1-2 h after pouring or were stored at 4°C for up to 1-2 weeks. Other media employed included CPGA and SMSA . The experiments were conducted during the period August 2013 to January 2014. The isolate ‘NH-01’, originally isolated after plating the bacterial ooze from a wilted ‘Namdhari Hybrid’ tomato plant at the Institute farm on KM-TTC  formed the original experimental isolate (NCBI KJ399970). Unless mentioned differently, all the experiments were set up with the re-isolate ‘NH-Av01’ (race 1, biovar 3) from the susceptible tomato cv. Arka Vikas. The identity of this isolate (NCBI KJ412034) was confirmed through 16S rRNA seqmatch analysis at the Ribosomal Database Project of the Michigan State University with the maximum homology to the Type Strain LMG2299 (EF06361). The closest matches (99% homology) from the NCBI included the strain GRs-Asm isolated from Zingiber officinale (Jorhat, Assam, India; JQ359677) and strain HNEPRS1 from eggplant (Hainan province of China; KF030881) as on July 2014. For the preparation of bulk glycerol stock, inoculum from 2-day old colony growth on CPGA was employed. For this the pooled inoculum from 4-5 typical fluidy-red colonies formed on KM-TTC following the streaking of -80°C glycerol stock was spotted on CPGA and the inoculum of 1.0 OD was prepared in autoclaved and filtered (0.2 µm) 20% glycerol, dispensed in 400 µl aliquots in 1.5 ml microfuge tubes (300 nos) and stored in three different -80°C freezer units to safeguard from unexpected instrument failure. Other isolates of R. solanacearum used in this experiment, which were obtained from different laboratories / geographic locations / crops, are described below under the section ‘KM-TTC peptone effects on different isolates of R. solanacearum’. The effect due to different KM-TTC media treatments on colony characteristics of R. solanacearum was assessed by spotting 20 times of 5 µl stock culture of -80°C glycerol stock of ‘NH-Av01’ (100 µl per plate) after pooling the 1.0 OD inoculum from the requisite number of tubes. Post spotting, the inoculum was allowed to dry by open incubation in the laminar air flow cabinet for 10-12 min and the plates were incubated upside-down at 30°C after sealing individually in polypropylene (PP) bags. 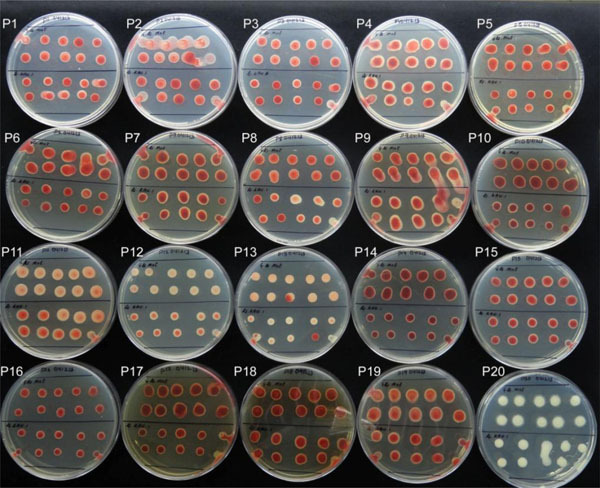 The colony characteristics were recorded based on visual assessment, colony diameter and scoring on a 0-5 scale for pigmentation (0, no pigmentation; 5, intense red-maroon color) and photographic documentation after 24-48 h in initial trials. In the subsequent trials, the extent of growth (which was also a reflection of the colony fluidity) was assessed per colony basis after retrieving the inoculum individually from three-six replicate spots (depending on the number of treatments) in 1 ml water by repeated rinsing (of the spot) until recovering all evident colony growth. This was followed by A600 assessment employing a uv/vis spectrophotometer (Genesys 10uv, Thermo Scientific, New Hampshire, USA). An estimate of the extent of pigment production per colony was obtained by spinning down the sample at 14000 ×g for 3 min and OD estimation of the supernatant at 500 nm. Considering that the red pigmentation in KM-TTC is due to formazan development from TTC, initial trials were planned around this constituent. TTC from two sources (HM and Sigma) was tried in KM-TTC employing freshly prepared and filter-sterilized stocks. Further, to assess whether the freezing and thawing of TTC stock could contribute to variations in colony characteristics, 1.25 ml aliquots for single-use in 250 ml medium, or the stock stored in 10 ml lots with recurrent thawing and re-freezing were assessed in comparison with freshly prepared TTC stock employing the Sigma and HM supplies. The basal medium included HM bacteriological peptone, casein enzyme hydrolysate type II (CH), dextrose and bacteriological agar. The peptone used here was selected from a lot that displayed fluidy- red colonies on KM-TTC. In the initial trial, two peptone types from HM, namely (A), bacteriological peptone (RM 001; enzymatic hydrolysate of animal tissues) and (B), type-1 bacteriological peptone (RM 667; mixed enzymic hydrolysate of lean meat tissues) were tried. As per the outcome of the above trial, peptone belonging to two lots from each type (identified as A1, A2, B1 and B2) were tested. Based on the emerging information, eight different lots from HM including four each of bacteriological peptone (A1 to A4) and type-1 peptone (B1 to B4) obtained from different laboratories (Table 1) were tried. Effect due to different types and lots of peptone on colony characteristics and pigmentation of Ralstonia solanacearum NH-Av01 isolate on KM-TTC medium documented on day 2 following inoculum spotting. Description of peptone belonging to different brands and lots (P1-P20) used in KM-TTC medium and the observations on colony characteristics of Ralstonia solanacearum isolate NH-Av01 recorded on day 2. In the next trial, different types of peptone (bacteriological, type-1, veg-bacteriological, microbiological or mycological as per the description given by different vendors) including varying batches / lots from one source (HM) or different brands (BD Biosciences, Sparks, MD, USA; Sigma-Aldrich, St. Loius, MO, USA; Biomatik Corporation, Cambridge, Ontario, Canada; Finar Limited, Ahmedabad, India; Sd-fine Chemicals, Mumbai, India) sourced from different laboratories were tested in KM-TTC medium. There were 20 media treatments altogether including KM-TTC with peptone from 19 distinct sources (P1 to P19) plus CPGA with P1 peptone as control (Table 2). The composite basal formulation constituted CH and agar from HM, and TTC from Sigma. The P1 medium used in this trial had a new lot of HM bacteriological peptone (06/13 manufacturing). P1-P7 constituted HM bacteriological peptone of different lots while P14-P16 included HM type-1 peptone from three lots. Some of the peptone lots used in this trial did not mention the manufacturing or the expiry date while a few had crossed the expiry, but were chosen with a view to test the effects due to ageing or hydration. Pooled and thoroughly mixed inoculum from six ampoules of glycerol stock was used for spotting (5 µl per spot ( 20) followed by incubation at 30°C and the assessment of colony characteristics and growth visually as well as through A600 and A500 estimations after 24-48 h.
Additional isolates from different geographical locations or crop sources were evaluated in comparison with ‘NH-Av01’ employing different KM-TTC (peptone) formulations. These included (i) ‘Rs-01-11’ isolate from eggplant, (ii), ‘Rs-09-94’ from chilli (race 1, biovar 3) sourced from Dr. R. Ramesh, ICAR Research Complex, Goa, South-West India, (iii), ‘GRs-Mnt’ (race 4, biovar 3), isolated from ginger (provided by Dr. Aundy Kumar, Division of Plant Pathology, Indian Agricultural Research Institute, New Delhi) and (iv), ‘KAU-Av01’ (race 1, biovar 3), isolated at the host laboratory from a wilted ‘Arka Vikas’ fruiting-stage tomato plant from the Agricultural Research Station, Kerala Agricultural University, Mannuthy, Kerala, South India, a hot-spot for bacterial wilt in solanaceaous vegetables. Glycerol stocks of these four isolates prepared and stored similar to the ‘NH-Av01’ isolate were spotted on the 20 media formulations (KM-TTC P1 to P19 and CPGA) followed by colony growth and pigmentation assessments. Assessment of the virulence of cultures derived from the 19 KM-TTC (peptone) sources was made together with the culture from CPGA through seedling-challenge assay under glasshouse conditions employing the native ‘NH-Av01’ isolate. In a preliminary trial, inoculation of two week old seedlings of tomato (Solanum lycopersicum) cv. Arka Vikas was undertaken employing 2 ml of 0.1 A600 inoculum (in water) per seedling. The experiment was repeated with root-injury-inoculation on two week old seedlings as per Thomas et al. . The trials were laid out in completely randomized design with seedlings raised in organic coco-peat in protrays employing 10 replications (7 seedlings / replication). The extent of disease incidence (irreversible wilting or seedling mortality) was recorded weekly for four weeks. The experiment was repeated once. Correlation coefficient (r) between the extent of colony growth (A600) or the pigmentation of colony supernatant in water (A500) and percent seedling mortality was worked out. Similarly, r between mortality (%) and pigment levels in the inoculum used for seedling inoculation (0.1 at A600) was determined to see if the pigment levels had any effect on culture virulence. To assess if the colony characteristics observed on different peptone media influenced the response of pathogen in biotype classifications, biovar assay was set up with ‘NH-Av01’as per Huang et al. . KM-TTC prepared with peptone from 11 different lots / types / brands that displayed considerable variation in colony characteristics or pigment levels (P1, P2, P7, P9, P10, P11, P12, P13, P15 and P18 with CPGA control; see Table 2) was used as the source of inoculum. The experiment was repeated once. Effect on bacterial lawn development towards organizing antagonistic assays  was investigated by plating the suspension of ‘NH-Av01’ grown in CPG broth on 20 KM-TTC peptone formulations as above. Plates (10 cm diameter; HM, Mumbai; cat. No. PW002-1(500N0) with 50 ml medium were applied with 125 µl of 0.1 A600 inoculum. After 4 h incubation at 30°C, 50 µl of 0.1 A600 inoculum of two test organisms that had shown antagonistic activity against the pathogen (Enterobacter sp. and Pseudomonas sp. ; Thomas unpublished results) were applied in marked wells. The plates were observed for lawn formation and inhibition-zone development for 2-4 days . This included casein hydrolysate (CH) and glucose. Casein hydrolysate from two sources, namely, enzyme hydrolysate type II from HM (CR 028; enzymic digest of casein type II) and that from Sigma (Fluka 22090; pancreatic hydrolysate of casein) were tried in KM-TTC. Other constituents (bacteriological peptone, glucose and bacteriological agar) were from Hi Media. The source of glucose included HM, Fischer Scientific, Mumbai; Sisco Research Laboratories, Mumbai; Sd-fine Chemicals, Mumbai and Loba Chemicals, Mumbai. In addition, substitution of glucose in the medium with sucrose was tried employing HM source. The experiments were laid out in completely randomized design  and the data were subjected to single factor ANOVA employing the data analysis tool of Microsoft Excel 2007. The mean ± SD values are presented in the results. The extent of colony growth, fluidity and red pigmentation were relatively more with Sigma TTC compared with HM TTC. This was reflected in the whole colony growth (A600 of 2.058 ± 0.110 and 1.548 ± 0.015, respectively) and the pigmentation of supernatant (A500 of 0.069 ± 0.0254 and 0.012 ± 0.002, respectively) documented on day 2. Thus, Sigma TTC stock was selected for use in all further experiments. No significant differences were observed in the extent of colony growth with the use of fresh, one-time thawed or three-times thawed stocks of TTC, either from Sigma or HM source, but the pigmentation levels showed some variation, which however was not statistically significant (Fig. 1a, b; Fig. 2). In general, freshly prepared Sigma TTC showed relatively more pigmentation than fresh HM TTC consistent with the observations in the initial trial. For the sake of convenience, TTC aliquoted and stored at -20°C was preferred. Colony characteristics of Ralstonia solanacearum ‘NH-Av01’ on KM-TTC medium with the TTC from two sources. 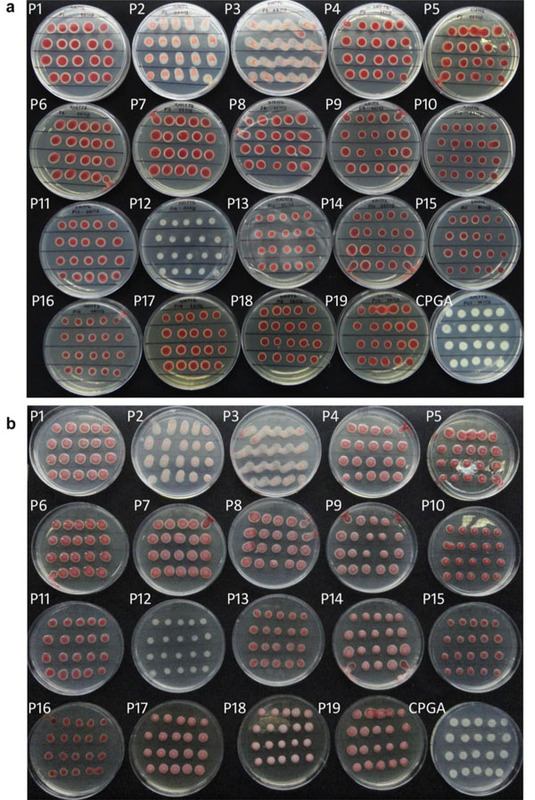 Colony growth as per OD at A600 (a) and pigmentation of supernatant at A500 (b) with the use of fresh, one-time thawed or three-times thawed stocks of TTC from HM and Sigma sources. Effect due to freshly prepared TTC versus frozen and thawed TTC employed in KM-TTC on colony characteristics of Ralstonia solanacearum ‘NH-Av01’ isolate. Medium prepared with fresh (a), frozen and one-time thawed (b) or three-times thawed (c) stocks of TTC from Sigma (upper row) or HM source (lower row). Comparing the colony growth of Ralstonia solanacearum ‘NH-Av01’ on KM-TTC with different types of peptone. New stock of Hi Media bacteriological peptone (A1) and an older lot (A2) and two lots of type-1 peptone including a recent (B1) and an older lot (B2) used in KM-TTC and documented photographically on day 1 (a) and day 2 (b). In grey scale, high red pigmentation appears dark in color and low pigmentation whitish. Effect due to different lots of bacteriological peptone (A 1-A4) or type-1 peptone (B1-B4) from Hi Media Biosciences source on colony characteristics and pigmentation of Ralstonia solanacearum ‘NH-Av01’ isolate recorded on day 2. Description of A1-A4 and B1-B4 as per Table 1. Colony growth of Ralstonia solanacearum ‘NH-Av01’ on KM-TTC with peptone belonging to different brands, types or lots. P1-P19 represents 19 different KM-TTC (peptone) formulations with different brands and lots as in Table 2 and P20 represents CPGA control. Considerable differences in the extent of colony growth and pigmentation observed as documented on day 2 in rear view (a) or in front view (b). 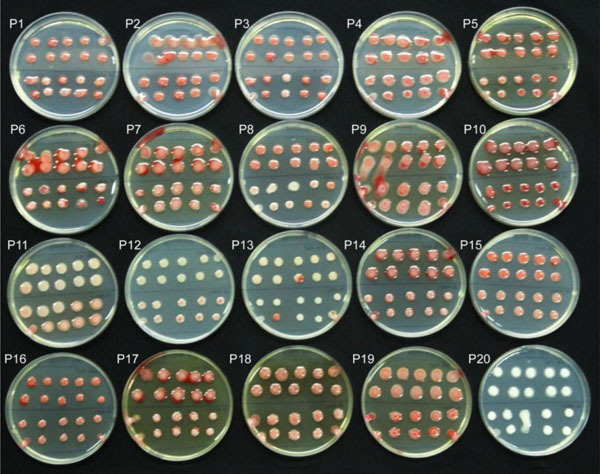 Colony growth as per OD at A600 (left panel) and extent of colony pigmentation as per A500 (right panel) of different isolates of Ralstonia solanacearum from various crop sources or geographic locations on KM-TTC documented on day 2. P1-P19 represents 19 KM-TTC peptone formulations with different brands and lots as in Table 2 and P20 represents CPGA control. The isolates included ‘NH-Av01’ from tomato, ‘Rs.01.11’ from eggplant, ‘Rs. 09-94’ from chilli, ‘GRs-Mnt’ from ginger and ‘KAU-Av01’ from tomato. The colony growth of Ralstonia solanacearum isolate ‘Rs.01.11’ from eggplant and ‘Rs. 09-94’ from chilli on KM-TTC (peptone) formulations with peptone belonging to different brands, types or lots. P1-P19 represents 19 different KM-TTC peptone formulations with different brands and lots as in Table 2 and P20 represents CPGA control. Upper two rows in a plate show ‘Rs.01.11’ and the lower two rows ‘Rs. 09-94’. Considerable differences in the extent of colony growth and pigmentation as documented on day 2 in rear view. The colony growth of Ralstonia solanacearum isolate ‘Rs.01.11’ from eggplant and ‘Rs. 09-94’ from chilli on KM-TTC (peptone) formulations with peptone belonging to different brands, types or lots. P1-P19 represents 19 different KM-TTC peptone formulations with different brands and lots as in Table 2 and P20 represents CPGA control. Upper two rows in a plate show ‘Rs.01.11’ and the lower two rows ‘Rs. 09-94’. Considerable differences in the extent of colony growth and pigmentation as documented on day 2 in front view of open plates. The colony growth of Ralstonia solanacearum isolate ‘GRs-Mnt’ from ginger (Race 4) and ‘KAU-Av01’ from tomato on KM-TTC (peptone) formulations with peptone belonging to different brands, types or lots. P1-P19 represents 19 different KM-TTC peptone formulations with different brands and lots as in Table 2 and P20 represents CPGA control. Upper two rows in a plate show ‘GRs-Mnt’ and the lower two rows ‘KAU-Av01’. Considerable differences in the extent of colony growth and pigmentation as documented on day 2 in rear view. The colony growth of Ralstonia solanacearum isolate ‘GRs-Mnt’ from ginger (Race 4) and ‘KAU-Av01’ from tomato on KM-TTC (peptone) formulations with peptone belonging to different brands, types or lots. P1-P19 represents 19 different KM-TTC peptone formulations with different brands and lots as in Table 2 and P20 represents CPGA control. Upper two rows in a plate show ‘GRs-Mnt’ and the lower two rows ‘KAU-Av01’. Considerable differences in the extent of colony growth and pigmentation as documented on day 2 in front view of open plates. Effect of peptone source in KM-TTC medium on the virulence of Ralstonia solanacearum during seedling challenge inoculation on tomato. Following root-injury and soaking-inoculation of cv. Arka Vikas (after two weeks of sowing), seedling mortality was recorded four weeks later (a). 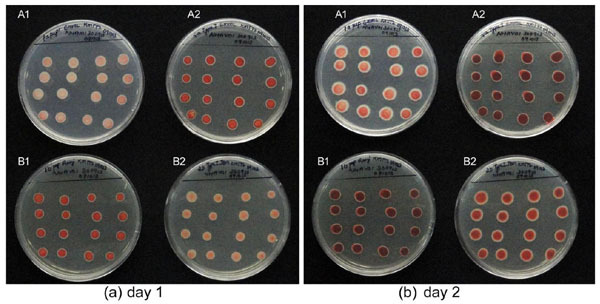 The extent of colony pigmentation in the supernatant of whole colony suspension and of the 0.1 A600 inoculum used for seedling challenge were recorded at A500 (b). 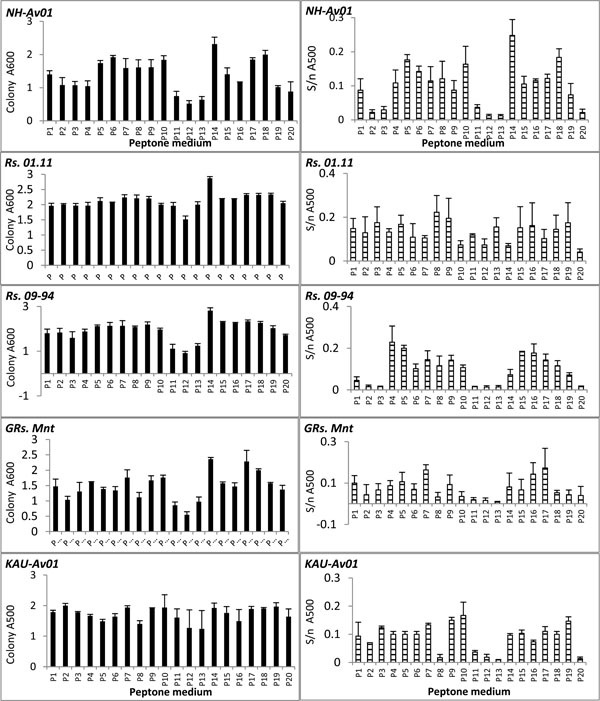 Effect due to peptone from 12 different sources on colony growth of Ralstonia solanacearum ‘NH-Av01’ in KM-TTC medium (a) and the response of the culture during biovar assay (b). Peptone treatments from different brands as indicated in Table 2. The biovar assay was as per Huang et al. . Treatments in the order control, glucose, trehalose, mannitol, sorbitol, dulcitol, maltose and cellobiose. 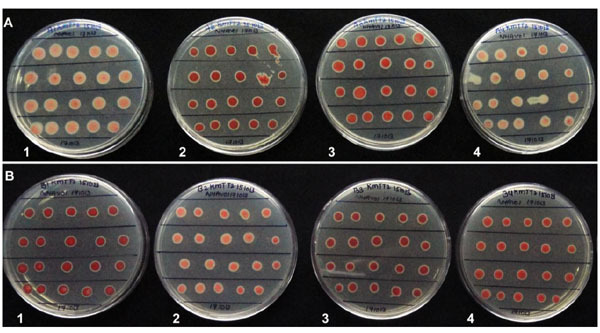 Effect due to different peptone sources in KM-TTC medium during antagonistic assayagainst Ralstonia solanacearum in agar-well diffusion assay. KM-TTC / CPGA medium prepared with different peptone formulations, plated with the isolate ‘NH-Av01’, and inoculated with 50 µl A600 culture of Enterobacter sp. (lower left) and Pseudomonas sp. (lower right) showing differences in the evenness of lawn, fluidity of culture and the extent or the clarity of clear-zone. Upper row shows distilled water and null controls. P1 to P20 as per Table 2. Effect due to glucose from different sources or sucrose in KM-TTC medium on colony characteristics of Ralstonia solanacearum ‘NH-Av01’. Glucose from Hi Media (a), Fischer Scientific (b), Sisco Research Laboratories (c), Sd-fine Chemicals (d) and Loba Chemicals (e), or sucrose (f) from Hi Media Biosciences. It was not possible to obtain a clear estimate of the extent of colony fluidity. In general, more the colony growth, the more was the culture fluidity and vice versa. Thus, the extent of colony growth documented by way of A600 estimation was also a reflection of the extent of culture fluidity. 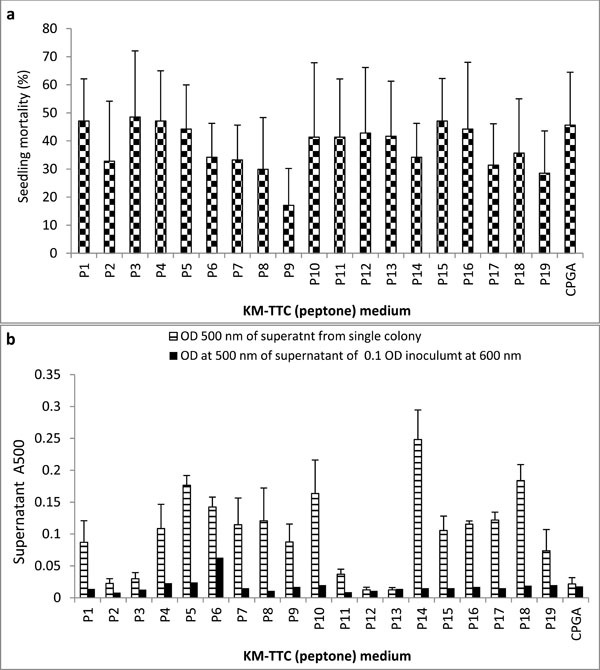 The chance observation that the failure of fluidy reddish colony development in KM-TTC coincided with the use of a new bottle of HM bacteriological peptone and that peptone formed the major constituent in KM-TTC medium prompted detailed experiments evaluating the effects due to peptone. As it was no more possible to evaluate the previous lot of peptone since the stock had run out, KM-TTC plates prepared with the earlier batch and stored at 4°C were used for validation which confirmed that the new lot differed from the previous one. This apparently suggested the chances of a defective new batch of peptone. Comparing the new stock of bacteriological peptone (A1) with another older lot (A2) along with two lots of type-1 peptone including a recent (B1) and an older lot (B2) (all from HM) indicated that both the type and lot of peptone had prominent effects on colony characteristics of R. solanacearum. While the A1 lot showed low pigment formation, A2 displayed proper colour development by 16-24 h. Type-1 peptone showed an opposite trend where the newer B1 stock displayed intense red colony colour and the older lot showed lighter pigmentation (Fig. 3a). By second day, the difference in colony pigmentation and fluidity became more obvious (Fig. 3b). By this time, 3 weeks had elapsed after the opening of the ‘A1’ stock and an increase in the extent of color development with the same lot was observed suggesting an ageing or hydration effect with the ‘A1’ peptone. Extending the observations to four lots of bacteriological peptone (A1- A4, where A4 was same as A1, but a sub-lot of it stored with loose capping under the ambient conditions for 2 weeks), or four lots of type 1 peptone (B1- B4) sourced from different laboratories endorsed that the extent of colony growth and colony color were significantly influenced by the peptone type and the lot (Fig. 4; Table 1). In general, it appeared that older the lot, more the colony fluidity and intensity of red coloration. The observations with the A1-derived sub-lot A4 also suggested the chances of such an ageing effect on growth and colony color. The time-span from the date of manufacturing and that after opening the bottle both appeared to influence the overall bacterial colony growth and the extent of pigmentation. The A2 and B4 lots which had crossed the expiry date showed good fluidy growth and high red color development. The trial employing 19 different KM-TTC peptone formulations with different brands and lots of peptone (P1-P19; plus CPGA control) again showed considerable differences in the extent of colony growth and pigmentation as documented on day 1. The differences between different lots, brands and type of peptone in this trial became more obvious by the second day by which time some treatments (eg. P2, P3) showed the tendency for colony spreading (Fig. 5,a,b). The rear view of the plates displaying the distinct pattern of a red centre and white outline gave a clearer indication of the pigmentation pattern (Fig. 5a) while the front view indicated the extent of fluidity (Fig. 5b). The extent of colony growth and pigmentation as per the colony diameter and the OD estimates indicated significant differences with the source of peptone employed (Table 2). Overall, colony growth and fluidity ranked highest in P8 medium (BD Peptone) followed by P14 (HM type-1 new lot) and P18 (mycological peptone). Growth was very poor in the case of peptone from FINAR (P12) and Sd-fine (P13). Visibly, the peptone from Sigma (P10), HM veg-peptone (P17) and HM mycological peptone (P18) showed intense maroon pigmentation. Others displayed pink to intense red colour or light (P13) to no pigmentation (P12). As per A500 assessment, P4, P5 and P7 ranked high in pigmentation (Table 2). In this trial, the treatments P1 to P7 constituted the same type of peptone (bacteriological) from a single source (HM). Lot to lot or batch to batch variation was evident in pigmentation, but this did not seem to correspond exactly with the duration since the date of manufacturing as observed with the P4 to P7 lots. The P1 lot, which was a newly acquired pack (10/13) with a recent date of manufacturing (06/13) displayed more pigmentation than most other lots while P2 and P3 sets belonging to the same lot but obtained from two different laboratories (02/13 manufacturing) lagged behind and varied in pigmentation. The same applied to P14 - P16 treatments all of which constituted type-1 peptone from HM. 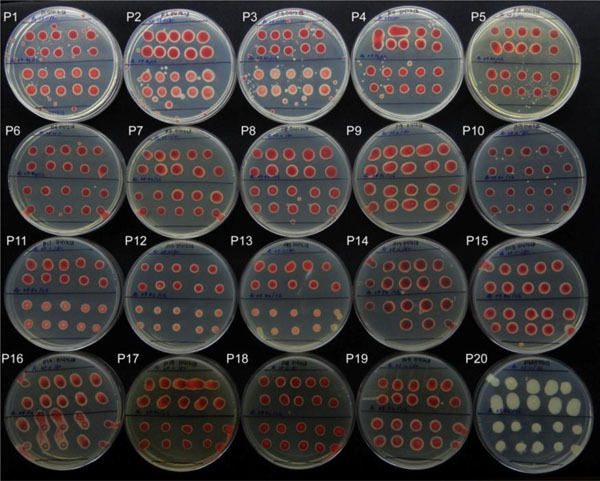 Several lots of bacteriological peptone from HM (P1, P4, P6, P7) showed similar colony characteristics as BD (P8), Difco (P9) or Sigma (P10) peptone. Observations with the four isolates representing different crops or geographic locations and belonging to the same or different races (1 or 4) endorsed that the extent of colony growth, fluidity and the intensity / the pattern of pigmentation of R. solanacearum on KM-TTC were notably influenced by the source of peptone (Fig. 6). However, some variation was observed in the response of different isolates. Among the two isolates from Goa, the eggplant isolate (Rs-01-11) showed relatively less variation while the chilli isolate (Rs-09-94) displayed a clearer effect on the bacterial colony appearance as documented on day 1 and day 2 (Fig. 7, 8). Between the ‘GRs-Mnt’ and ‘KAU-Av01’ isolates, such effect was more striking in the former (Fig. 9, 10). In a preliminary trial, where mere soil-drenching inoculation was practiced with the ‘NH-Av01’ isolate, some amount of variation in pathogenicity was observed where the cultures from P13, P17, P18, P19 and P20 appeared more virulent, P1, P3, P8 and P15 proved medium virulent while the rest were low in virulence (data not shown). In the next trial, where root-injury-inoculation was adopted, significant differences in the extent of disease incidence was observed depending on the source medium (Fig. 11a; P = 0.013). In this trial, which was set up during the cooler months of December-January (average day and night temperatures of 18°C and 26°C), the disease incidence was overall less compared with other times with the temperatures around 25-32°C. However, the disease incidence at 4 week stage was relatively high (≥ 40%) in P1, P3, P4, P5, P10, P11, P12, P13, P15, P16 and CPGA while it was low (< 30%) in P8, P9 and P19 and intermediate in the rest. The extent of disease incidence did not appear to be correlated with the overall growth of the culture on the KM-TTC medium (r between seedling mortality at 4 weeks and culture OD at 600 nm -0.323; df = 19, NS), or the pigmentation (r between seedling mortality and the A500 of the supernatant -0.063; df = 19, NS). Further, the pigment levels in the inoculum used for seedling challenge (0.1 at A600) was quite low (Fig. 11b). However, it appeared that some of the treatments where the pigment production was very negligible (P3, P11, P12, P13 and CPGA), the disease incidence was relatively high. No effect due to the peptone source in KM-TTC medium on biovar classification was observed in spite of the considerable variations observed in the colony characteristics and pigment levels in the 11 different KM-TTC formulations and CPGA (Fig. 12). The ‘NH-Av01’ isolate, irrespective of the medium-source, showed the utilization of all the sugars qualifying to be biovar 3. The development of lawn, its uniformity/evenness, thickness and colour as well as the clear-zone formation were significantly modified by the peptone source used in the lawning-medium (Fig. 13). As per the observations on the second day, P6, P10, P14, P17, P18 and P19 media formulations showed notable colour development in the lawning medium and the clear-zone development was very obvious in these instances. Thus it appeared that the pigmentation in the lawning medium and the inhibition zone development were notably modified by the source of peptone used in the KM-TTC medium. Fluidy red-white colonies were formed on KM-TTC with HM and Sigma CH with a slightly more reddish pigmentation in the latter. The difference, however, was not significant (colony growth at A600 of 1.61725 ± 0.1035 and 1.7035 ± 0.12347, respectively, and the supernatant A500 of 0.0725 ± 0.0095 and 0.0655 ± 0.020, respectively) as documented on day 2. Based on the above observations, CH (type II) from HM source was employed in the studies involving different lots and brands of peptone. No obvious differences in colony growth or the pigmentation levels were observed with the source / brand of glucose as observed on day 2 (Fig. 14). Substitution of glucose with sucrose did not show any significant effect on growth or pigmentation as on day 1 or day 2 (data not shown). The present investigations were driven by the frequently encountered variations in colony physiognomies with the wilt pathogen R. solanacearum, namely colony color and fluidity and the inconsistent results during the seedling-challenge trials using the same isolate maintained as glycerol stocks. R. solanacearum is known to lose its virulence when maintained actively in culture due to the formation of avirulent mutants or phenotypic conversion [1, 5, 7, 8]. The TTC medium was developed by Kelman  basically to address this issue of phenotypic variants. Fluidy colonies on KM-TTC medium with light red pigmentation proved virulent while the avirulent mutants formed deep red butyrous colonies [1, 21]. Short-term storage in water with revival at ≤ 6 months and long-term storage as glycerol stocks are practiced to maintain the pathogen in virulent form [7, 10, 21, 22]. Following such inconsistencies in colony characteristics and pathogenicity, the original strain ‘NH01’ was re-isolated from challenge-inoculated Arka Vikas seedlings  and the problem appeared resolved with the -80°C storage of bulk prepared glycerol stocks of this isolate (NH-Av01) where such mutants are not expected to arise. The red pigmentation in KM-TTC is due to the development of formazan from 2,3,5-triphenyl tetrazolium chloride resulting from the microbial dehydrogenase activity [23, 24]. When variations were encountered in colony colour, the prime suspect, therefore, was the stock of TTC. Although it was possible to attribute some of these differences to TTC from the two sources (HM and Sigma), it did not explain the variations while considering the usage of this chemical from a single source. The use of fresh versus frozen or recurrently thawed samples also did not explain the source of such variations. The chance observation that the medium prepared with the bacteriological peptone from a newly opened bottle failed to show good color development guided the comprehensive experiments with different types, lots / batches and brands of peptone. Trials undertaken in the meantime to see if the other constituents, namely, glucose or casein hydrolysate would have such modifying influences did not show significant effects. Exhaustive experiments with peptone, which formed the major constituent in KM-TTC (10 g l-1), covering different types, brands and lots, have established that the peptone source played a significant role in governing the amount of colony growth, colony fluidity and the pattern or the extent of culture pigmentation. 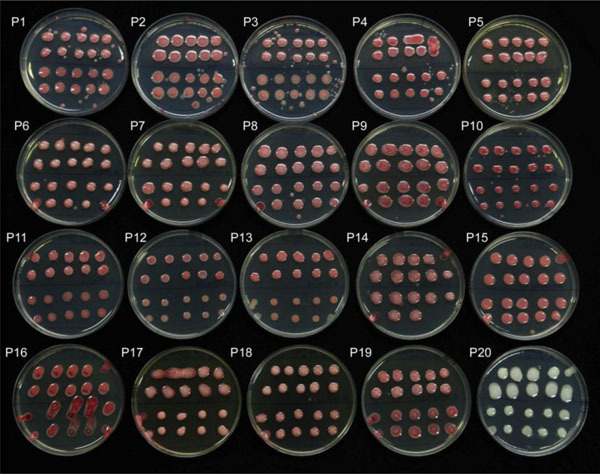 The observations assume significance as these colony characteristics are generally taken as indicators of the virulence or its loss while the pathogen is being maintained actively in vitro, during its isolation from soil or plants, or upon revival from short-term or long-term storage [1, 7, 8, 10, 12, 13, 25]. The confirmatory observations on different isolates originated from different locations and crops and the variation in pathogenicity as well as the results from the antagonistic assays indicated that the present findings are highly relevant. It is known in microbiology that the constituents employed in the medium significantly influence the cultivability or the growth of an organism or its physiology. This justifies the existence of different media formulations. A study with different sources of peptone in buffered peptone water on Salmonella showed variation in the ability for the recovery of stressed cells  or significant effects on growth dynamics . Similar effects have been reported with tryptone in the non-selective medium for Escherichia coli . In general, researchers pay little attention to the source of a particular constituent when supplies are from standard firms where the accessibility and cost may form the major considerations. In this respect, we relied on chemicals and dehydrated media from a major supplier from this country (Hi Media Biosciences, Mumbai) with an international reach in over 125 countries and one among the top three brands in microbiology (http://www.himedialabs. com/HML/pages/aboutus.aspx). No specific advantage in terms of colony characteristics or virulence of the pathogen was observed due to the use of imported brands (BD / Difco / Sigma / Biomatik) which were remarkably more expensive. The original report by Kelman  does not mention about the source of peptone but only of casein hydrolysate from Difco. Different publications citing this formulation or its further amendments also do not indicate the source of different constituents [eg., 9, 21, 29]. With the acquisition of different companies by BD Biosciences, the range of media, peptones / hydrolysates and extracts originally supplied by BBL Microbiology Systems and Difco Laboratories including the Bacto™, BBL™ and Difco™ lines are now credited to BD . Peptones are mainly used as nitrogen source in the medium and it supplies the various amino acids [27, 30, 31]. They are hydrolysates of protein prepared by treating the raw material with acids, bases or proteolytic enzymes. Protein from various sources such as animal (meat, collagen, gelatin, whey, casein), vegetable (soybean, grains) and microbes (yeast) are used as the source of peptone. Enzymatic hydrolysis is the preferred approach for which the enzyme from various sources are employed . A scan of profiles of peptone produced by BD Biosciences (Sparks, MD, USA) and Hi Media Biosciences shows a wide choice of peptone types. The unique characteristics of each peptone product depends on the quality and source of the protein starting material, the quality and source of the enzyme, and the method of hydrolysis used to make the peptone [27, 30, 32]. It was important to note that out of the 19 KM-TTC (peptone) combinations employed in the investigations, seven of them (P1 to P7) included one type of peptone from a single source (bacteriological peptone from HM) with considerable lot to lot variations. This suggests that certain aspects of peptone manufacturing are beyond the control of manufacturers or attributable to inconsistencies in the supplies even if the manufacturing process is quality regulated [27, 30]. Initial trials with different HM lots suggested that this was partly contributed by the hydration effect with an improvement in pigmentation and fluidity with the ageing, which was also achieved to some extent by aerating the sample with the loose capping of the container. This hypothesis was supported by the observation with some of the older lots including those which were quite old with no mention of the date of manufacture or expiry, or that crossed the expiry date with them displaying very good pigment development. This aspect, however, could not be ascertained with the BD BactoTM peptone as this lot (P8), although procured very recently after the initial variable observations with the HM bacteriological and type-1 peptones, belonged to a lot manufactured nearly a year ago (Jan 2013) with validity for four years. On the other hand, the proteos peptone from Difco (P9) which was over a decade old also yielded pigmented fluidy colonies similar to P8. Brand to brand variation was also striking with some of the brands (FINAR Limited, Sd-fine) showing very low colony growth or failing altogether in pigment development. The unexpected sudden changes in colony characteristics observed in a laboratory could thus be linked to the opening of a new pack of peptone or the use of borrowed lots from other sources. Such issues may go unnoticed if media preparation and the conduct of experiments are done by different personnel in the laboratory. It was quite significant to note that the KM-TTC (peptone) medium had a major influence on the virulence of the pathogen derived from it modifying the host-pathogen interaction effects. While the inoculum from some media sources showed high disease incidence, it was quite low in a few instances. We could not precisely find the explanation for the variation in virulence with the inoculum from different KM-TTC sources. The virulence of R. solanacearum is known to be influenced by several characteristics such as increased extracellular polysaccharide (EPS) production, endoglucanase, polygalacturonase and pectin methylesterase activity, motility and/or the modifications in type III secretion systems [33-39]. In this study, no direct relationship was observed between the extent of culture fluidity and virulence. Whereas the stocks with less fluidy characteristic (P11, P12, P13) showed high virulence, some of the highly fluidy types (eg., P7, P8, P9) showed low pathogenicity. Recently, nitrate assimilation has been cited as a major factor governing the virulence of this pathogen . Peptone being a major source of nitrogen supply, the availability of nitrates in the lot may be a major influencing factor [27, 30-32]. It warrants further detailed investigations to understand the exact cause of such variations which is our next plan of research investigation. Although TTC helps in the selection of virulent colonies of R. solanacearum, it is considered to be slightly bacteriostatic . However, in our studies, similar or better colony growth compared to CPGA was observed with various isolates in KM-TTC prepared with the same lot (P1). In this study, no correlation could be found between the overall growth of the culture on the KM-TTC medium or the extent of pigmentation versus the percent disease incidence. Further, the pigment levels in the inoculum employed for seedling challenge (0.1 at A600) was very low to have any significant effects due to this. Some of the treatments where the extent of colony growth or the pigment production in KM-TTC was quite negligible (eg. FINAR or Sd-fine peptone), the disease incidence was relatively more compared with other high-pigment producing treatments. However, this was not consistent. The observations altogether endorsed that the media constituents need to be taken into account while conducting host-pathogen interaction studies. The uniformity and the evenness of lawn are important during the assays to identify antagonistic agents or evaluating the interaction effects . The significant effects on inhibition-zone formation in different KM-TTC (peptone) formulations during the plating trials was an endorsement that the media constituents also needed to be taken into account while planning microbe-microbe interaction studies. It was worth noting that the media source did not influence the response of the culture in biovar assays. The possibility of any mixture in the stock culture appeared remote considering that the glycerol stock or the resultant growth did not show different colony types on KM-TTC during recurrent streakings and that the culture passed the direct sequencing of 16S rRNA PCR product with the use of bacterial universal primers . As per this study, it is not possible to give a clear recommendation as to which brand or type of peptone to be used in KM-TTC medium. This documentation helps in bringing the awareness that the constituents employed in Kelman medium  could significantly alter the physiognomies of R. solanacearum. The findings suggest that finer aspects about the media constituents such as brand, type, batch / lot or time after manufacturing (within the best by date) which are considered trivial in nature need to be examined with more prudence while addressing microbial physiology and pathogenicity. Such aspects in turn may have a direct or indirect bearing on the molecular investigations employing such cultures which is now widely practiced in plant pathology and microbiology. One suggestion that emerged as per the experience from the current series of experiments was to check the different lots of media constituents at the time of first use, particularly peptones, for the culture performance in the expected way. The hallmark of this study has been exposing a major issue of inconsistent colony characteristics and virulence of R. solanacearum by identifying the peptone-incited effects. Some amount of inconsistency with respect to colony characteristics was still encountered even after identifying the peptone-incited effects indicating that the issue is a complex one. This aspect is under our further investigations. The observations here mark the beginning to consider the developing of an inorganic medium for this pathogen to avoid such variations due to the organic constituents. This study brings to light the significant modifying effects by the source of a specific constituent used in a bacteriological medium, namely peptone, on the physiology of a microorganism imparting implications on colony characteristics, virulence and responses during antagonistic assays. 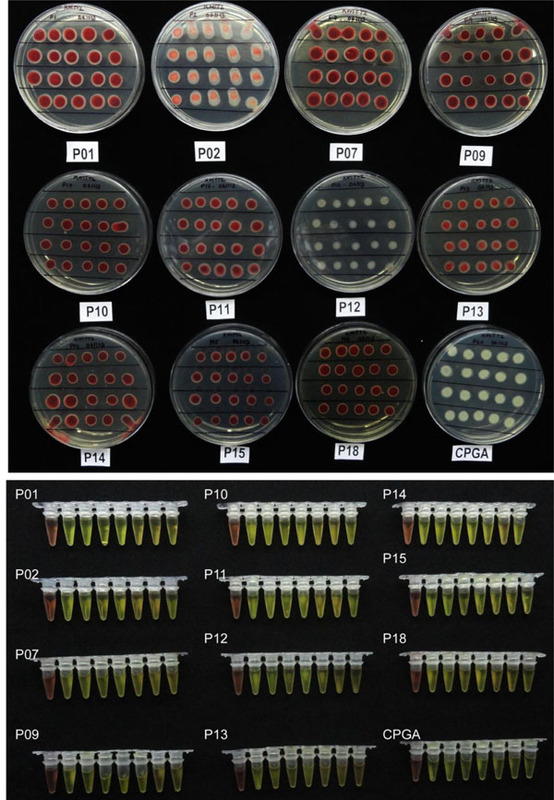 The outcome of the study suggests that casually observed variations in colony characteristics of the phyto-pathogen R. solanacearum in different laboratories, at various times or with batches of media could be arising from the variations in the medium constituents and may not be merely resulting from the mutations or the loss of virulence of the pathogen as is generally attributed. The observations affirm that care needs to be exercised while selecting media constituents towards culture maintenance or while picking virulent colony types of this plant pathogen in KM-TTC medium. It also highlights the importance of controlling minor differences in the composition of nonselective growth media in studies on bacterial physiology and while planning host-pathogen and microbe-microbe interaction studies. HM	 = Hi Media Biosciences, Mumbai. KM-TTC	 = Kelman triphenyl terazolium chloride medium. TTC	 = 2,3,5 triphenyl terazolium chloride. The authors declare no conflict of interest. The usage of different brands of supplies of chemicals in this study is based on the accessibility and availability and do not indicate the endorsement or otherwise of any particular brand by the authors or the Institution. The supply of Ralstoniasolanacearum cultures by Dr. R. Ramesh, ICAR Research Complex, Goa, India and by Dr. Aundy Kumar, Division of Plant Pathology, Indian Agricultural Research Institute, New Delhi are gratefully acknowledged. The supply of peptone and other constituents by different researchers at this Institute and other Institutions (National Bureau of Agriculturally Important Microorga-nisms, Mau, Uttar Pradesh, National Centre for Biological Sciences, Bangalore and the University of Agricultural Sciences, Bangalore) are thankfully acknowledged. The study was funded partly under the IIHR project “Use of endophytic bacteria for alleviating Ralstonia wilt in tomato” and the ICAR-AMAAS project, “Basic and Applied Investigations on Endophytic Microorganisms in Horticul-tural Crops”. The help rendered by Aparna, Sadiq , Divya and Shivrudriah during the conduct of some of the trials is gratefully acknowledged. The authors thank Dr. T. P. Rajendran, Director, National Institute of Biotic Stress Management, Raipur, India for the critical reading of the manuscript. Thanks to Aparna and Mujawar for the suggestions on the manuscript. The publication bears IIHR contribution No. 08/2014. Kelman A. The relationship of pathogenicity in Pseudomonas solanacearum to colony appearance on a tetrazolium medium. Phytopathol 1954; 44: 693-96. Hayward AC. Biology and epidemiology of bacterial wilt caused by Pseudomonas solanacearum. Annu Rev Phytopathol 1991; 29: 65-87. Kumar A, Sarma YR, Anandaraj M. Evaluation of genetic diversity of Ralstonia solanacearum causing bacterial wilt of ginger using REP-PCR and PCR-RFLP. Curr Sci 2004; 87: 1555-61. Patil VU, Gopal J, Singh BP. Improvement for bacterial wilt resistance in potato by conventional and biotechnological approaches. Agric Res 2012; 1: 299-316. Genin S, Denny TP. Pathogenomics of the Ralstonia solanacearum species complex. Annu Rev Phytopathol 2012; 50: 67-89. Buddenhagen IW, Kelman A. Biological and physiological aspects of bacterial wilt caused by Pseudomonas solanacearum. Annu Rev Phytopathol 1964; 2: 203-30. Mori T, Inada T, Ogawa K, Matsusaki H, Matsuzoe N. Phenotypic conversion of Ralstonia solanacearum in water extract of Solanum toxicarium. J Plant Pathol 2012; 94: 535-42. Kelman A, Hruschka J. The role of motility and aerotaxis in the selective increase of avirulent bacteria in still broth culture of Pseudomonas solanacearum. J Gen Microbiol 1973; 76: 177-88. Champoiseau PG, Jones JB, Momol TM , et al. Ralstonia solanacearum race 3 biovar 2 causing brown rot of potato, bacterial wilt of tomato, and southern wilt of geranium. http: //www arsusdagov/SP2UserFiles/Place/00000000/opmp/RalstoniaR3b2May2010pdf Accessed on 10 April 2014. Mori T, Ozaki K, Matsusaki H, Matsuzoe N. Behavior and mutation of Ralstonia solanacearum in Solanum toxicarium grown in aseptic culture. J Gen Plant Pathol 2007; 73: 142-6. Tans-Kersten J, Huang H, Allen C. Ralstonia solanacearum needs motility for invasive virulence on tomato. J Bacteriol 2001; 183: 3597-605. Dannon EA, Wydra K. Interaction between silicon amendment, bacterial wilt development and phenotype of Ralstonia solanacearum in tomato genotypes. Physiol Mol Plant Pathol 2004; 64: 233-43. Kumar A, Prameela TP, Suseelabhai R , et al. Host speciκcity and genetic diversity of race 4 strains of Ralstonia solanacearum. Plant Pathol 2014. Ramesh R, Joshi AA, Ghanekar MP. Pseudomonads major antagonistic endophytic bacteria to suppress bacterial wilt pathogen, Ralstonia solanacearum in the eggplant (Solanum melongena L. World J Microbiol Biotechnol 2009; 25: 47-55. Huang Q, Yan X, Wang J-F. Improved biovar test for Ralstonia solanacearum. J Microbiol Meth 2012; 88: 271-4. Thomas P, Sadashiva AT, Upreti R, Mujawar MM. Direct delivery of inoculum to shoot tissue interferes with genotypic resistance to Ralstonia solanacearum in tomato seedlings. J Phytopathol 2014. Thomas P, Upreti R. Influence of seedling age on susceptibility of tomato plants to Ralstonia solanacearum during protray screening and at transplanting. Amer J Plant Sci 2014; 5: 1755-62. Elphinstone JG, Hennessey J, Wilson JK, Stead DE. Sensitivity of different methods for the detection of Ralstonia solanacearum in potato tuber extracts. EPPO Bull 1996; 26: 663-78. Thomas P, Upreti R. Testing of bacterial endophytes from non-host sources as potential antagonistic agents against tomato wilt pathogen, Ralstonia solanacearum. Adv Microbiol 2014; 4: 656-66. Paulson DS. Biostatistics and Microbiology A Survival Manual. Heidelberg Sprnger 2008; 216. French EB, Gutarra L, Aley P, Elphinstone J. Culture media for Ralstonia solanacearum isolation, identification and maintenance. B W Sec 8-97 Fitopathol 1995; 30: 126-30. Janse JD. Phytobacteriology : Principles and Practice. CABI Publishing Oxforshire 2005. Gunz FW. Reduction of tetrazolium salts by some biological agents. Nature 1949; 163: 98. Turner N, Sandine WE, Elliker PR, Day EA. 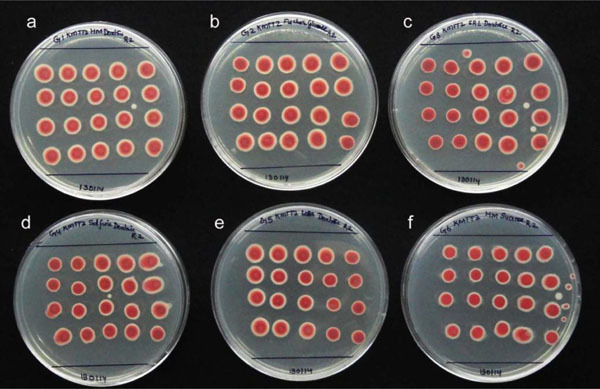 Use of Tetrazolium dyes in an agar medium for differentiation of Streptococcus lactis and Streptococcus cremoris. J Dairy Sci 1963; 46: 380-5. Poussier S, Thoquet P, Trigalet-Demery D, Matthieu A, Trigalet A. Host plant-dependent phenotypic conversion of Ralstonia solanacearum from non-pathogenic forms via alteration in the phcA gene. Mol Microbiol 2003; 49: 991-1003. Baylis CL, MacPhee S, Betts RP. Comparison of two commercial preparations of buffered peptone water for the recovery and growth of Salmonella bacteria from foods. J Appl Microbiol 2000; 89: 501-10. Gray VL, Müller CT, Watkins ID, Lioyd D. Peptones from diverse sources pivotal determinants of bacterial growth dynamics. J Appl Microbiol 2007; 104: 554-65. De Spiegeleer P, Sermon J, Lietaert A, Aertsen A, Michiels CW. Source of tryptone in growth medium affects oxidative stress resistance in Escherichia coli. J Appl Microbiol 2004; 97: 124-33. Granada GA, Sequeira L. A new selective medium for Pseudomons solanacearum. Plant Dis 1983; 67: 1084-1088. BD Biosciences BD BionutrientsTM Technical manual 3rd ed. In: Sparks MD USA BD Bioscience. 2006. Habeeb AFSA, Shotton E. The examination of a bacteriological peptone. J Pharm Pharmacol 1956; 8: 197-201. McAlpine JG, Brigham GD. 1928 Some chemical studies of commercial bacteriological peptones. J Bacteriol 1928; 16: 251-6. Hendrick CA, Sequeira L. Lipopolysaccharide-defective mutants of the wilt pathogen Pseudomonas solanacearum. Appl Environ Microbiol 1984; 48: 94-101. Denny TP, Back S. Genetic evidence that extracellular polysaccharide is a virulence factor of Pseudomonas solanacearum. Mol Plant-Microb Interact 1991; 4: 198-206. Saile E, McGarvey J, Schell M, Denny T. Role of extracellular polysaccharide and endoglucanase in root invasion and colonization of tomato plants by Ralstonia solanacearum. Phytopathol 1997; 87: 1264-71. Huang Q, Allen C. Polygalacturonase are required for rapid colonization and full virulence of Ralstonia solanacearum on tomato plants. Physiol Mol Plant Pathol 2000; 57: 77-83. Milling A, Babujee L, Allen C. Ralstonia solanacearum extracellular polysaccharide is a specific elicitor of defense responses in wilt-resistant tomato plants. PLoS ONE 2011; 6: e15853. Jacobs JM, Milling A, Mitra RM , et al. Ralstonia solanacearum requires PopS, an ancient avre-family effector, for virulence and to overcome salicylic acid-mediated defenses during tomato pathogenesis. mBio 46 2013. Coll NS, Valls M. Current knowledge on the Ralstonia solanacearum type III secretion system. Microb Biotechnol 2013; 6: 614-20. Dalsing BL, Allen C. Nitrate assimilation contributes to Ralstonia solanacearum root attachment, stem colonization and virulence. J Bacteriol 2014; 196: 949-960. Weisburg WG, Barns SM, Pelletier DA, Lane DJ. 16S ribosomal DNA amplification for phylogenetic study. J Bacteriol 1991; 173: 697-703.